Clearly I've been watching too many Snow White movies lately. I had every intention of making this a Lovely Jester, but when I got the heart spirelli made and chose the paper and laid everything out the first thing that came to my mind was Mirror, Mirror On The Wall. So this 2 weeks I'm on the Anything Goes side of the challenge with this card. I used the Oval Harlequin 1 and the Stylized Spirelli Heart to create this simple, but elegant card. I used silver blending filament to wrap the heart, and added the tiny red gems for the finishing touches. I hope you take the time to click on the link above and see the phenomenal projects my team members created for the 2nd part of this challenge. You'll definitely get lots of artistic inspiration from taking a look. Hope to see you entering at Art With No Boundaries in the next 2 weeks and don't forget if you enter the bonus round be sure to put BR after your name so that you will be eligible for the prize. She does really look like she should be saying "Mirror Mirror on the wall". I love the heart spirelli and the way you wrapped it. Her colouration is just lovely. The background looks upholstered...so cool. She looks stunning and I like your Mirror mirror version of it! Nothing is wrong with Snow White! =) Gorgeous background too! 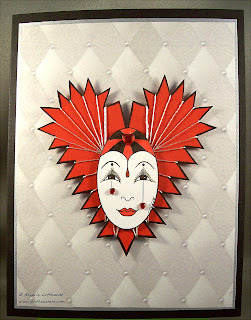 That red spirella heart trimmed in black is fabulous and the background you created is stunning! 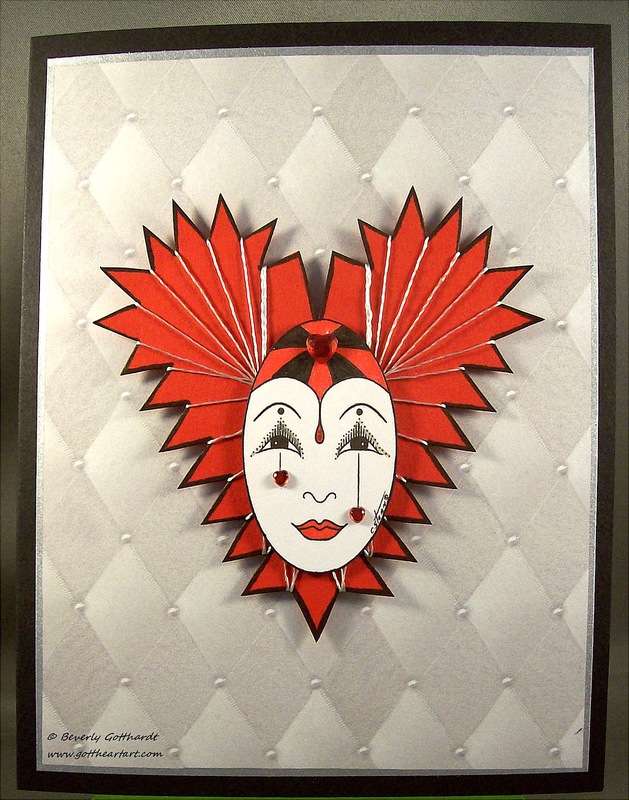 Beverly, This is such a cool piece and it really does depict the idea of Mirror Mirror on the wall beautiful. Your use of the spirelli heart reminds me of those high collars queens use to wear, and the red adds a bit of drama to her. She is beautiful as well as just a bit wicked looking. Love this.